The Lubbock area is being hit with up to 8 inches of snow. Texas Tech has canceled classes, power lines are down, and the roads are dicey. Meanwhile, the chances that DC will get anywhere near that much continue to drop. 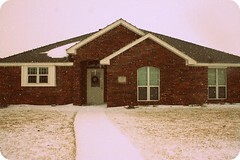 Here's a link to the above picture of Amarillo snow.